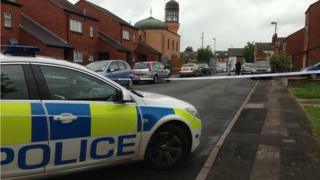 A bomb found at a mosque in Walsall is being investigated by the West Midlands Counter Terrorism Unit. A package, later confirmed as a bomb, was found in an alleyway beside Aisha Mosque on Friday by a member of the public. Residents of Rutter Street reported later they had heard a bang "like a firework" on Friday evening. Police were not called until the package had been taken into the mosque on Saturday evening. The suspected explosion caused minor damage and no injuries. Local resident Mudasar Iqbal said he heard the blast. He said: "I parked my car [at my house] and I was taking my daughter inside when I heard the bang and saw the smoke." Mr Iqbal told the BBC he later found part of the device and took it to the mosque where it was then taken to the imam before being retrieved by police. Assistant Chief Constable Sharon Rowe said terrorism experts and specialist investigators had been called in to support the inquiry. She said: "The force is taking this attack against the mosque very seriously and we have a major investigation under way. "At this stage we are keeping an open mind on a motive. "There is no evidence or intelligence to suggest that this is an act of terrorism." West Midlands Police said it was believed to be an isolated incident but patrols had been increased for public reassurance. Ziaul Haq, from Aisha Mosque, said he was grateful police were "taking this seriously" and "investigating thoroughly". "We have beautiful relationships with the local community and we've never had any trouble at all at our mosque. "We are not too worried about this and we have every confidence in the police," he added. About 150 people were evacuated from homes in the Caldmore area around the mosque while initial police investigations were undertaken. Worshippers were allowed to return to the mosque for prayers on Sunday afternoon. Zahid Ali, cabinet member for public protection at Walsall Council, said: "We stand shoulder to shoulder together as a community in support of the police. "Walsall has really shown its mettle in coming together and responding with calm determination." The Bishop of Wolverhampton, the Right Reverend Clive Gregory, said he was "disturbed" by the discovery of the bomb at the mosque. "It is a place where the hospitality and warm welcome I have received at meetings with other faith leaders remains fresh in my memory," he said. "I am sure they will stand with me in condemning any sinister action against any part of our diverse but harmonious communities."